The U.S. Mint would like to believe their current activities in the 21st Century are a renaissance of coin design, but coin collectors couldn’t disagree more. Among coin collectors, the true renaissance of U.S. coinage occurred from 1907 to 1921. From the common cent to twenty dollar gold pieces, every coin underwent sweeping design changes that produced some of the most artistic and beautiful coins ever released by the mint. Ask any collector what they believe are the most beautiful coins ever minted and you’ll get a vote for at least one denomination from this period. One such example is the Standing Liberty Quarter twenty five cent coin. Designed by Hermon Atkins MacNeil, with a composition of 90% silver and 10% copper, the Standing Liberty Quarter was produced from 1916 through 1930. On the obverse, Lady Liberty is featured standing while she carries an upraised shield in her left hand (to represent protection) and an olive branch in her right hand (to represent peace). The intent of the symbolic representation told the world that the United States of America was prepared for anything (war or peace). Additionally, the obverse design shows the word LIBERTY, the designer's initial M located to the right of the date, a mint mark located to the left of the date (Philadelphia issues carried no mint mark) and the motto IN GOD WE TRVST. No Trust is not spelled incorrectly, the spelling was based on the Latinized version of trust where a U is drawn as a V.
The reverse design features an eagle in flight. Additionally, the reverse design shows the legend UNITED STATES OF AMERICA QUARTER DOLLAR near the rim, the motto E PLVRIBVS VNVM above the eagle (latinized spelling where "U" is represented as "V"), 13 stars near the rim (to represent the original 13 colonies) and three stars below the eagle. 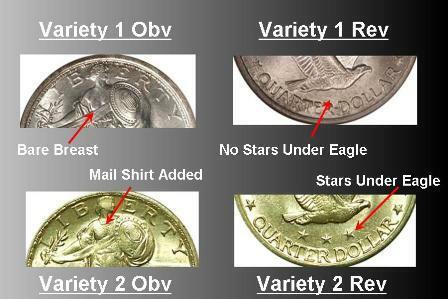 Varieties 1 & 2 -The Standing Liberty was originally portraying Lady Liberty with an exposed or bare breast on the obverse and with no stars below the eagle on the reverse from 1916 to 1917 (Variety1). During 1917, the obverse design was modified to add mail to cover the bare breast and three stars were added to the reverse just below the eagle (Variety 2). Some historians argue that this change occurred because of public outcry of the bare breast, while others contend that the changes were actually design enhancements. Uncirculated versions of Variety 1 & 2 obverse designs are easy to differentiate but circulated specimens are a different story as the mail tended to wear and it was difficult to tell the two apart. 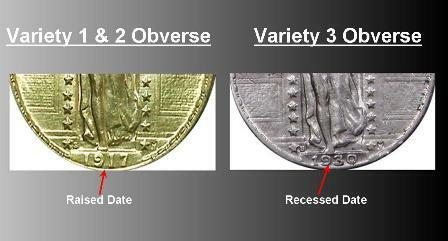 The easiest identification method for circulating coins is to look at the reverse design. If there are three stars below the eagle it is variety 2, if there are none then it is variety 1. Variety 3 - A third design variety was produced from 1925 to 1930. Like the Buffalo nickels, Standing Liberty quarters had a raised date that wore down quickly. 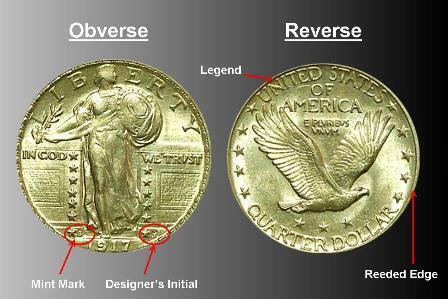 To resolve this issue the mint recessed the date below the design to reduce wear. Interestingly, some collectors view this variety as a minor or sub-variety. This is kind of odd as in the Buffalo nickel series it is considered a major variety but for the quarter it is minor. Sound confusing? Being unsure why there are different standards for different coin series we play it safe and include it as a major variety. Luckily for type set collectors, there is only one coin type but there are three major design varieties. An additional note, this is a sleeper series! If you look at the total mintage for all years combined (226,770,400) and compare it to just one current statehood quarter mintage you’ll be amazed at how many coins are being minted today for one coin in contrast to this entire series. Based on this perspective, you would think that an example will cost thousands of dollars. To the contrary, examples are very affordable, especially for coins minted from 1925 to 1930.